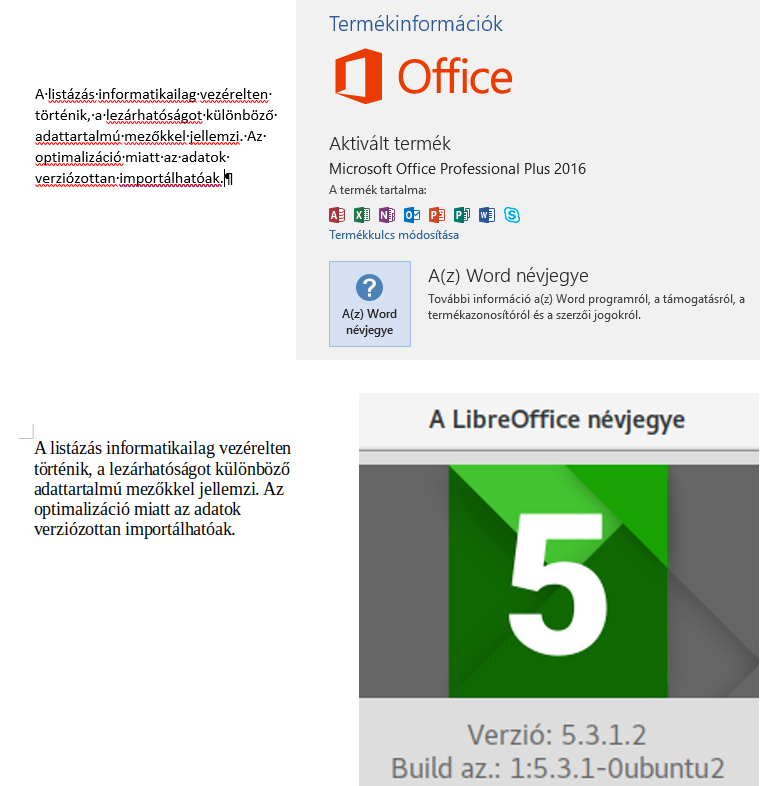 This page compares the features of LibreOffice 6.2.3 (download) and Microsoft Office 2019 / 365. It separates major and minor feature differences and also includes notes on LibreOffice extensions. The comparison highlights differences and therefore does not display any features which are present in both office suites. The feature comparison table is continuously being updated and is work in progress. It is a compilation by users and not an official document by the Document Foundation. Cross-platform availability (desktop) Windows, macOS, Linux, FreeBSD, NetBSD, OpenBSD, and Haiku. (based on the same code base). Windows and macOS. Windows and macOS versions have some document format compatibility problems, somewhat different feature sets and differences in the user interface; macOS version does not include the database application MS Access, does not include MS Publisher, and also lacks a number of other features (see below). Feature inconsistencies/differences in Windows versions, between "MS Office 2019" sales version and the "Office 365" rental version: some features are being subsequently included only in the rental version (newly added features also differ between macOS and MS Windows) leading to inconsistencies in the feature set (see below). Supported versions of MS Windows Windows 7 SP1, 8, 8.1, 10, Server 2008, Server 2012, Server 2016. (). Versions until LibreOffice 5.4 still also support Windows XP SP3, Vista. MS Office 2019 sales version: Windows 10; Server 2019. MS Office 365 rental version: Windows 7 SP1, 8.1, 10, Server 2008 R2, Server 2012, Server 2016 (). Availability free of charge Yes (download, donate) No, proprietary software to purchase or rent. When subscription for the rental version ends, applications enter read-only mode (view or print) and no new documents can be created. The purchase-version is a perpetual license. One-month trial version available for the rental version (but not for the one-time purchase version). Extension availability Complex ecosystem of extensions (over 360 on extensions.libreoffice.org and over 800 on extensions.openoffice.org), including automatic updates. Partly, no centralized extension system for add-ons and macros. Microsoft AppSource for Office 365. Office Apps not supported on macOS. Support of Right-to-left⁠ (RTL) languages (e.g. Arabic) and other complex scripts Comprehensive support, based on HarfBuzz⁠ text shaping library Supported on Windows, mobile and online versions and macOS. Support of complex languages and special smart-font features (ligatures, true small caps, old style numbers, proportional or mono-spaced numbers, capital spacing, and true superscript/subscript) Limited support: full support of SIL Graphite font technology (,) and full support of OpenType optional features (,,) by syntax, with UI: tdf#58941. See LibreOffice Smart Font HowTo. Interoperability: No support for optional OpenType features in OOXML, and ODF 1.2 don’t provide OpenType optional features support (support scheduled for ODF 1.3) Limited via OpenType supporting ligatures, stylistic sets, number spacing options, number forms, and contextual alternates. Support for optional OpenType features in OOXML. Support of font variation Limited support for font rendering on screen, no support for printing and PDF export. tdf#108497 Limited support for font rendering on screen, no support for printing and PDF export. Easy access to vector clip art Yes via LO Gallery (clipart extensions ( or )). Extension for the integration of clipart from OpenClipart.org Selection more limited. Feature to include a selection of "icons". PDF export extended options Multiple options (Additional options: Tagged PDF, Time stamp protocol⁠ , detailed image settings, Hybrid PDF, transition effects, extended security and permission options, PDF forms, initial view settings, extended handling of URLs, digital signatures, and PDF signatures according to PAdES⁠ standard). Support for font embedding of all font types (incl. OpenType .otf fonts). High or low quality PDF, page and markup to print in Access, Word, Excel, and PowerPoint ; pictures resolution and non-printing informations in Publisher. No support for font embedding of OpenType (.otf) fonts in PDF export . Import of Encapsulated PostScript (EPS) vector graphics (.eps) Supported (with some rendering issues: tdf#81497, tdf#67464) Support for .eps images entirely removed in Office 2019 and rental version (. In Office 2016 sales version, it was ) turned off by default due to security issues, but could be manually enabled via Windows registry. There were general rendering issues of .eps files in PDF export (). Drawing and vector graphics software LibreOffice Draw, drawing and vector graphics software that supports pages (up to 300cm x 300cm), layers, numerous drawing tools and DTP features. Partial. MS Powerpoint provides some features of a drawing software. PIM and email software Not part of LibreOffice, referring to alternative PIM software such as Mozilla Thunderbird. See the comparison on this wiki: Mozilla Thunderbird vs. Microsoft Outlook. Mail Merge Wizard sends out emails directly from LibreOffice without email software. LibreOffice-wide access to address books via Base. Integrated Development Environment (IDE) feature set The BASIC Integrated Development Environment (IDE) does not have: 1. Refactoring facilities (Renaming affects dependencies/Extract Method/Extract interface etc.) (tdf#92251, tdf#94524, tdf#94526, tdf#94527, tdf#94528, tdf#94529, tdf#94530); 2. Intellisense (or any other code completion functionality) such as auto-code-completion and showing the properties and methods of an object (tdf#66185); 3. Error checking (the IDE actually knows its symbols). Supported with Visual Basic for Applications and/or additional purchase of Office Developer Tools for Visual Studio (Windows-only). macOS version only supports a simplified Visual Basic Editor. Versions of office suite for mobile operating systems (smartphones, tablets) Ports for Android and iOS are in development, viewer for Ubuntu Touch/UBPorts. LibreOffice Viewer for Android available, with basic and experimental editing features, more information: Android port wiki, , . LibreOffice for iOS (iPhone, iPad) is in development: Preview for iOS; other porting effort: LibreOffice Light. The Document Viewer of Ubuntu Touch is powered by LibreOfficeKit and therefore supports viewing most file types supported by LibreOffice. Android, iOS and Windows Mobile. Mobile versions for smartphones and tablets with Android and iOS with restricted features set, for 'Windows 10 Mobile' smartphones with heavily restricted feature set. Professional users as well as users on tablets >10.1 inch are required to have an eligible Office 365 subscription at a monthly fee. Private users are allowed to view and print documents without registration private users, basic editing functionality requires registration. More comprehensive features require an eligible Office 365 subscription at a monthly fee. Synchronous collaborative editing Partial. Collaborative editing in LibreOffice online version (Writer, Calc and Impress). Not available in the desktop applications (tdf#73831), see development information: Collaborative Editing and Track changes. Supported in online versions of MS Word, Excel and Powerpoint. Partial support in desktop applications via OneDrive or MS Sharepoint. Support in desktop applications varies: "Real-time typing" in MS Word, Powerpoint, "Co-authoring" in MS Excel (not supported in MS Powerpoint and MS Excel in MS Office 2019 sales version; MS Powerpoint 2019 sales version only allows for co-authoring (syncing after saving file). Simplified "sharing" of office documents in MS Word, Excel, Powerpoint via OneDrive, OneDrive for Business, or SharePoint. AutoSave feature, which automatically saves every few seconds, is supported in MS Word, MS Excel, and MS Powerpoint, if files are stored on OneDrive, OneDrive for Business, or SharePoint Online (Not available in MS Office 2019 sales versions on macOS and Windows. Real-time collaboration for MS Word supported in MS Office 2019 sales version on Windows). User interface improved to enable use on touch screen devices on desktop operating systems. No (tdf#102015) Slightly adjusted user interface for touch screen devices, but no redesign. Keyboard driven menu system (search function to better find features in office suite). Not supported. Only via help system. On Ubuntu Unity support for Head-Up-Display (HUD) system. (tdf#91874) Supported, Tell Me search bar. Accessibility checker Not supported. Extension for text documents: AccessODF Supported . Chat with other authors (collaborative editing) Not supported. In-app chat with co-authors for shared files on SharePoint Online or OneDrive for Business. Not supported for OneDrive Consumer or any other storage location. Non-persistent chat (history not preserved; new users see only newly incoming messages). (Not supported in MS Office 2019 sales version; not supported on Android and iOS). . Integration of instant Messaging (IM), voice, video, or screen sharing. Not supported. Skype integration (not supported in macOS version). Inserting and editing 3D models Not supported (previous support in Impress for glTF (.dae/.kmz) 3D models removed in version 6.0) Supported in Powerpoint, Word, and Excel. Collaboration with @mentions in comments Not supported Supported, in PowerPoint, Excel, Word, and Outlook. Supported in Windows rental version, not supported in MS Office sales versions. Quick access to email attachments Not supported Supported, "Shared with me" feature in PowerPoint, Excel, Word. 21 languages (plus 1 language variant) were supported in MS Office 2013 with additional costs); no information on supported languages in MS Office 2016. Grammar check on macOS version limited to few languages. Bibliographic features Basic inbuilt support. Excellent free extensions: e.g. Zotero, Bibus, JabRef as well as proprietary extensions. Inbuilt support. Excellent free extensions: e.g. Zotero as well as proprietary extensions. Unique Spreadsheet functions CURRENT, DDE, MONTHS, OPT_BARRIER, OPT_PROB_HIT, OPT_PROB_INMONEY, OPT_TOUCH, STYLE, EASTERSUNDAY, YEARS, DAYSINMONTH, DAYSINYEAR, GOALSEEK, ISLEAPYEAR, MULTIPLE.OPERATIONS, MULTIRANGE, MVALUE, NEG, ROT13, WEEKS, WEEKSINYEAR, FORECAST.ETS.MULT, FORECAST.ETS.PI.MULT, FORECAST.ETS.STAT.MULT, RAWSUBTRACT, REGEX, ROUNDSIG. CUBEKPIMEMBER, CUBEMEMBER, CUBEMEMBERPROPERTY, CUBERANKEDMEMBER, CUBESET, CUBESETCOUNT, CUBEVALUE, RTD, DBCS, CALL, REGISTER.ID, PHONETIC, YEN. Keep the copy of cells (usability of copy&paste) Supported. (Copy of cells is kept for pasting, even if the user does other tasks like typing or inserting cells) Supported in Windows rental version, not supported in MS Office 2016 sales version and not supported in macOS version. Statistical / Analysis toolkit Built-in Data Statistics Wizard with additional features: Chi2-test, Logarithmic regression, Power regression Add-on, not activated by default. Additional features: Fourier analysis, Histogram, Random number generation, Rank and percentiles, and some more detailed options. Additional chart types: Waterfall, Histogram, Pareto, Box & Whisker (Box plot), Treemap (Mosaic), Sunburst, Funnel Not supported (tdf#74665, tdf#81530,tdf#70361,tdf#72992, tdf#97832) Supported. Multi-Core Processing / multithreading Parallel formula compiling on the CPU. OpenCL/GPU threading in Calc core (,). Multithreading is work in progress: tdf#65046, , Presentation "Making Calc Calculate in Parallel". Starting in Excel 2010, the following features use multi-core processors: saving a file, opening a file, refreshing a PivotTable (for external data sources, except OLAP and SharePoint), sorting a cell table, sorting a PivotTable, and auto-sizing a column. Additional cell format types Number format "Boolean value". Engineering notation. Natural language number format (spelling out numbers in various languages. Easy work around for missing US zip code and US phone number formats. Partial, engineering notation via custom formats. Support negative year date (BCE) Supported. Partially support, using work-arounds. Conditional formatting: icon sets 2 additional smilies icon sets. No reverse icon order (tdf#61313). Customization of icon sets, e.g. reverse icon order. Sheet protection options (allow users certain actions in protected sheets) Supported for select protected/unprotected cells and insert/delete rows/columns. Supported for select protected/unprotected cells, insert/delete rows/columns, format cells/columns/rows, insert hyperlinks, sort, use AutoFilter/Pivot Table reports, edit objects/scenarios. Map charts and 3D geospatial visualization tool Not supported (via extension GeOOo) Map charts and "3D Maps". Automatized analysis and visualization features Not supported Supported Quick analysis feature and visual summaries, trends, and patterns. , . Some of these features ("Ideas in Excel") supported in rental version, not supported in MS Office 2019 sales version; quick analysis feature not supported on macOS. Presentation remote control for smartphones/tablets For Android smartphones/tablets, iOS (iPhone/iPad), and Pebble smartwatches. For WindowsPhone 8 and Android (smartphones only), but with additional features for Excel and Word. (Not supported in macOS version). Export presentation to video formats Not supported (tdf#34959) Supported to .mp4 and .wmv formats. Export up to 4K resolution. Wollmux is a complex centralized system for templates, forms and letter heads developed by the city of Munich (in German and English language). Read Text. Read selection of text with Calc, Draw, Impress, Web Writer and Writer using speech synthesis. OOoLilyPond, use LilyPond musical notation within LibreOffice. COOoder or Code Highlighter provide syntax highlighting for LibreOffice Writer. Libre OCR allows to convert images to editable documents using an external OCR service (based on Tesseract OCR). Footswitch. A transcription tool working wholly within LibreOffice Writer. TradutorLibreText. Tool to translate texts in several languages. Anaphraseus CAT tool. Macro set for Computer Aided Translation similar to famous Wordfast. Writer Rotation Tool, allows to rotate an image in a text document using the mouse, like others graphical objects. Export Freemind allows to export Writer documents to Freemind mind manager. Power Detective enhances Detective/Trace Precedents and Trace Dependents. LibreWeb, a tool to fill spreadsheet cells with data from different web pages. Remove Duplicates, quickly remove duplicates in Calc. New Jaguar Calc add-in provides SQLREQUEST function. Export as Images allows to export all the Impress slides or Draw pages as images of JPG, PNG, GIF, BMP, and TIFF format. A set of gallery themes to draw diagrams like circuit diagram. 1600 maps, diagrams, graphs, for geography and history. All countries, all states, all regions and all historical periods. BaseDocumenter fully document a LibreOffice Base application. odt2daisy, converts OpenDocument Text (ODT) to digital talking books in the DAISY format (DAISY 2.02, DAISY 3.0 XML and Full DAISY 3.0) for speech synthesis. Read Text, it uses an external program or a web service to read text. Read the selection with Calc, Draw, Impress, Web Writer and Writer. AccessODF, helps authors evaluate and repair accessibility issues in OpenDocument Text and other word processing formats supported by Writer. odt2braille, enables authors to print documents to a Braille embosser and to export documents as Braille files. The Braille output is well-formatted and highly customizable. This page was last edited 14:37:49, 2019-03-02 by Krasnaya Ploshchad. Based on work by Gerald Treppel and Bartosz Kosiorek and others.